Dollops of Diane: Cute Bunny Craft with Cotton Balls! We were supposed to get 6-8 inches of snow the other day but somehow ended up with just over two feet. Since we were somewhat unexpectedly homebound we passed our time with some crafts. This bunny craft came out pretty cute if I do say so myself. Cut out the inner circle of the paper plate. Plates are more sturdy for glue/cotton but if you don’t have plates you could just use a piece of construction paper. Trace two ear shapes on white construction paper and cut them out. Color the inner part of the ear pink (could also use pink construction paper for this if you have it). Glue (or staple) ears on to paper plate. 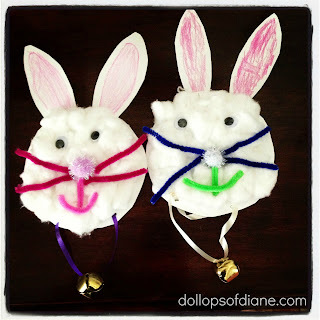 Decorate bunny with eyes, nose, whiskers, and mouth. We used googly eyes, pom poms, and pipe cleaners (cut) that we had around the house. We also had ribbon and bells left over from a previous craft so we gave the bunnies necklaces. After all, what makes a craft better for kids? Making it a noisy craft!